The breeze seems to have reversed in the country’s wind energy capital. Wind energy majors, which were investing full throttle in Tamil Nadu, are moving to Karnataka, Andhra Pradesh and Maharashtra. 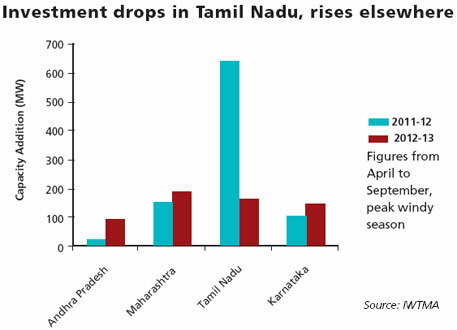 This at a time when Tamil Nadu reels from a huge power deficit of 4,000 MW. At least 12-hour daily power cut is routine. The state has some of the best windy sites in India and its installed wind energy capacity is 7,134 MW. This is about 40 per cent of the country’s 18,000 MW installed capacity. 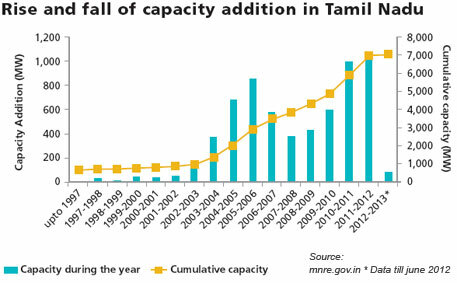 Tamil Nadu has a target capacity addition of 5,000 MW during the 12th Five Year Plan. But this seems unlikely to be met. Renewable energy developers are upset with the Tamil Nadu Electricity Board (TNEB) over delayed payments for the power it buys from them. They are also annoyed because the infrastructure for transmission of wind energy is inadequate. Their frustration escalated after the Central government recently withdrew the fiscal incentive of 80 per cent Accelerated Depreciation in the first year. This allowed developers to defer income tax payments. “Why should developers continue investing in the state when there is nothing to pull them back?” asks K Kasturiranagan, chairperson of the Indian Wind Power Association, a national organisation of wind developers. The result: a sharp dip in the power generation capacity addition in the state. Till the first half of 2012-13, only 162.95 MW was added compared to last fiscal’s 644.21 MW capacity addition, figures of the Indian Wind Turbine Manufacturers’ Association (IWTMA) show. Earlier, Tamil Nadu attracted investment of Rs 7,000 crore in wind energy every year. But the current fiscal is likely to close with an investment of merely Rs 1,300 crore, a drop of around 81 per cent, says IWTMA. Most of the state’s southern districts—Kanyakumari, Tirunelveli, Thoothukudy, Theni and Coimbatore—are very windy. During the Southwest monsoons, strong winds at a speed of 18-25 km per hour blow from the Arabian Sea through four major gaps in the Western Ghats—Palghat, Shencottah, Aralvaimozhi and Kambam passes. Most wind farms are located close to these passes. Muppandal, with about 3,000 windmills in the Aralvaimozhi Pass, is the largest windmill cluster in Asia. About 80 per cent of the total wind energy is produced from April to September when the state gets strong winds. The Central government started promoting commercial generation of wind energy in 1993 with incentives such as Accelerated Depreciation, concessional custom duty on certain components of wind electric generators, excise duty exemption, 10 years’ tax holiday on income generated from wind power projects, and loans from the Indian Renewable Energy Development Agency and other financial institutions. The state offered wheeling and banking of energy. TNEB offered to wheel power to the sites where industries have installed windmills. The developer would give five per cent of the energy generated as wheeling charge. Banking of energy is just like banking of money. Developers can deposit excess power to the state electricity grid and withdraw it when required. For this too, the charge is five per cent of what is deposited. Unlike other states, Tamil Nadu allowed investors to buy private land directly. It soon became the most sought-after destination for private developers, with generation capacity increasing as well (see ‘Rise and fall of capacity addition in state’). Interestingly, the state government’s share in wind power generation is minuscule at 19 MW. TNEB, which is responsible for installing substations and transmission lines, is making huge losses and is debt-ridden. The board has an accumulated loss of more than Rs 53,000 crore. So despite sharp growth in the installed wind power capacity, the Board could not develop adequate infrastructure. “While we generate energy, consumers are power-starved. There is no proper evacuation and transmission facility to take power from pooling stations to consumers,” says Kasturirangan. Main industrial hubs are located in the state’s northern parts while most wind farms are in the southern region. This is a big problem. Last year alone, about 350 MW, about 10 per cent of the state’s total deficit, was lost during the peak season. “This is a national loss when 40 per cent of the country’s population does not have power,” says Kasturirangan. Developers complain that at the peak of the windy season when they expect revenues to maximise, TNEB disconnects some windmills from the grid, leaving significant generation capacity unutilised. But officials at Tamil Nadu Generation and Distribution Company (TANGEDCO) and Tamil Nadu Transmission Company (TANTRANSCO), which are parts of TNEB, deny the charge. There should be a balance between different forms of energies injected into the grid. Else, the grid may collapse, states the Indian Electrical Grid Code. Some machines are disconnected from the grid during peak generation because there is a possibility of grid collapse due to high energy penetration, say officials. 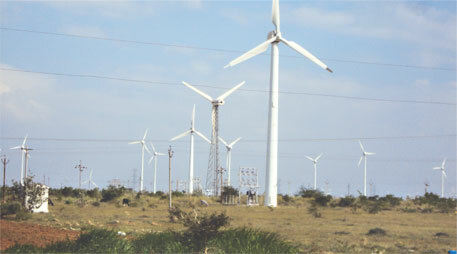 Most of the turbines in Tamil Nadu’s best wind sites have completed their life span of 20 years. They need to be replaced with modern windmills. But repowering is a complicated issue. New turbines cost almost double the old ones. Second, developers would need a no-objection certificate from the Tamil Nadu Electricity Board (TNEB) and pay infrastructure development charges once again. Despite this, the connection will not be considered new because the plot is the same. This means the developer will be paid old tariff due to the Preferential Tariff order issued by the Tamil Nadu Energy Regulatory Commission in 2006. This does not make sense, say developers. Then there is micrositing norm of 5DX7D. According to this, the distance between two windmills in a single row should not be less than five times the diameter of the bigger rotor, and the distance between two rows should not be less than seven times the diameter of the rotor. This means all the windmill owners within a plot have to agree for repowering. But most them have power purchase agreements signed at different times with the TNEB. The officials have a point. Wind energy contributes 30 per cent of the total energy production in the state. This is the highest in the world, says S Gomathinayagam, executive director of Chennai-based Centre for Wind Energy Technology, an autonomous institution under the Ministry of New and Renewable Energy. Even Denmark, which produces a quarter of the world’s total wind energy, has only 23 per cent of wind energy penetration. “But had the grids been strong enough, this would not have been a problem. Weak grids result in low capacity utilisation of windmills,” he says. Wind technology has undergone tremendous changes. Modern wind machines with taller towers and larger rotors are more efficient. They have 80-metre tower height and 80-metre rotor diameter. The old ones had 30-40 metre height and 40 metre rotor diameter. “More wind power can be generated at higher altitude because wind speed increases with height,” points out Gomathinayagam. Though the state has exceeded its estimated wind energy generation potential of 5,374 MW at 50 metre height, the predicted potential at 80 metre height is 15,000 MW,” he says. According to him, the state can go for 10,000 MW of additional capacity, provided the grid capacity is increased. But the ailing TNEB is unable to do this. Developers say they pay Rs 35 lakh as infrastructure development charge to TNEB for a 1-MW windmill. The amount should have been spent on laying transmission lines. “But the Board diverts the money for repayment of debts,” alleges Kasturirangan. TNEB buys wind power from the developers at Rs 3.05 per unit and sells it to different consumers at an average price of Rs 4.99. As per the power purchase agreement, the Board should make payments to the wind power suppliers within 30 days of raising the sale invoice. But it never makes payments on time. Installation cost of a 1-MW windmill has almost doubled from Rs 3.5 crore in 1994 to Rs 6 crore now. “Every project is being executed with equity and loan arrangement,” says K Venkatachalam, chief adviser, Tamil Nadu Spinning Mills Association. TANGEDCO has not made payments for the past 15 months. This makes loan repayment difficult and cripples the financial functioning of wind developers, he says. According to Indian Wind Power Association, in the April-September wind season this year, TNEB earned Rs 15,065 crore by selling purchased wind energy as well as banked wind energy to consumers. Yet, the Board failed to pay the dues to wind power suppliers. Gujarat makes the payments within two weeks, while Maharashtra and Karnataka pay in one month. TNEB now charges 95 paise for a unit when banked energy is withdrawn. Developers object to paying this charge. Independent observers feel the banking system has added to TNEB’s burden. “Developers give excess energy to the Board during April-September and withdraw power during the other half of the year when the state buys power from outside paying up to Rs 7 for a unit,” says retired TNEB engineer S Gandhi, who has studied the state’s power shortage scenario. Investors have moved the Appellate Tribunal for Electricity against the Preferential Tariff order issued in 2006 by the Tamil Nadu Energy Regulatory Commission (TNERC). The order fixes a tariff of Rs 2.75 per unit for project agreements signed before 2006. It is Rs 2.90 per unit for later agreements. TNERC has issued orders enhancing the rate from Rs 2.90 to Rs 3.39 per unit, effective from April 2009. The case is in the Supreme Court. Some cases against TNEB are also pending in the Madras High Court. TNEB is setting up five 400-KV substations and three 230-KV substations with 765-KV transmission lines to address the bottlenecks in evacuation of wind power. Chief Minister Jayalalithaa has sought Rs 4,160 crore from the Clean Energy Fund, which is with the Union Finance Ministry. The state also hopes to get priority in the Central government’s proposed Green Energy Corridor Project. The delay in paying is now 19 months. We have invested and are suffering though we have no fault. TNEB should make efforts to close the gap by paying 2 months together every month. In such way they can pay the dues within 10 months.